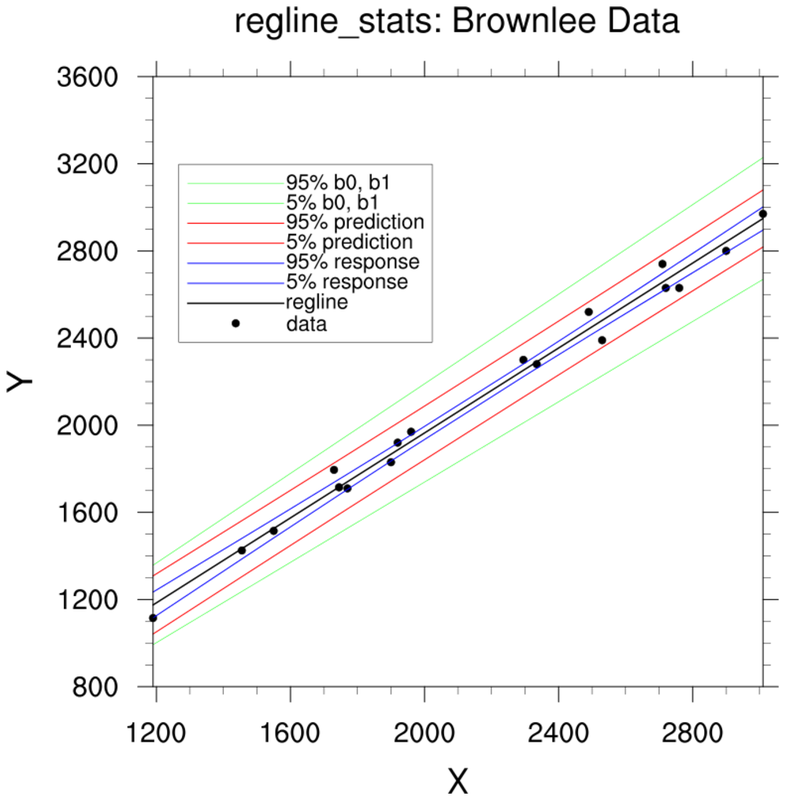 (b) regline_stats which performs linear regression and, additionally, returns confidence estimates and an ANOVA table. (d) reg_multlin_stats which performs multiple linear regression (v6.2.0) and , additionally, returns confidence estimates and an ANOVA table. There are two other regression functions (regcoef, reg_multlin) but these are used less frequently. They are maintained for backward compatibility only. Linear and multiple linear regression models make a number of assumptions about the independent predictor variable(s) and the dependent response variable (predictand). A primary assumption is that the response variable is a linear combination of the regression coefficients and the predictor variables. Further, the predictor variable(s) are assumed to be uncorrelated. 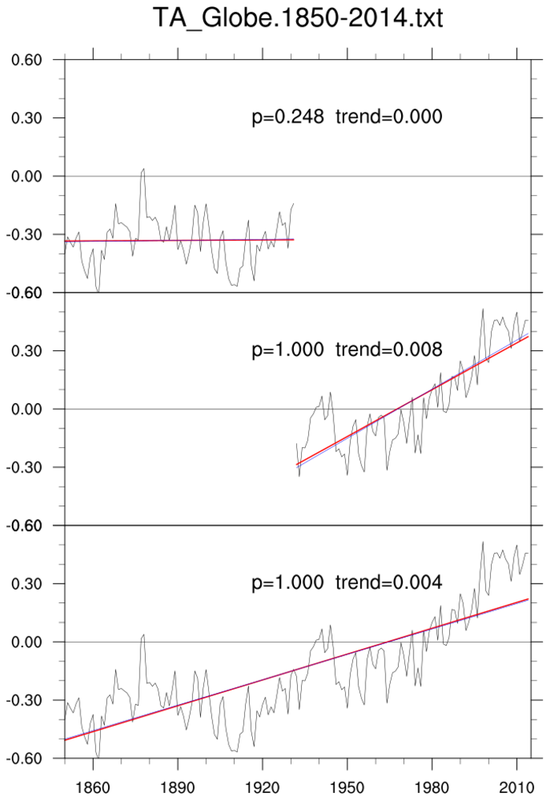 Trend: In addition to regression, other methods can be used to assess trend. The well known Mann-Kendall non-parametric trend test statistically assesses if there is a monotonic upward or downward trend over some time period. A monotonic upward (downward) trend means that the variable consistently increases (decreases) through time, but the trend may or may not be linear. The MK test can be used in place of a parametric linear regression analysis, which can be used to test if the slope of the estimated linear regression line is different from zero. The regression analysis requires that the residuals from the fitted regression line be normally distributed; an assumption not required by the MK test, that is, the MK test is a non-parametric (distribution-free) test. The Theil-Sen trend estimation method "is insensitive to outliers; it can be significantly more accurate than simple linear regression for skewed and heteroskedastic data, and competes well against non-robust least squares even for normally distributed data in terms of statistical power. 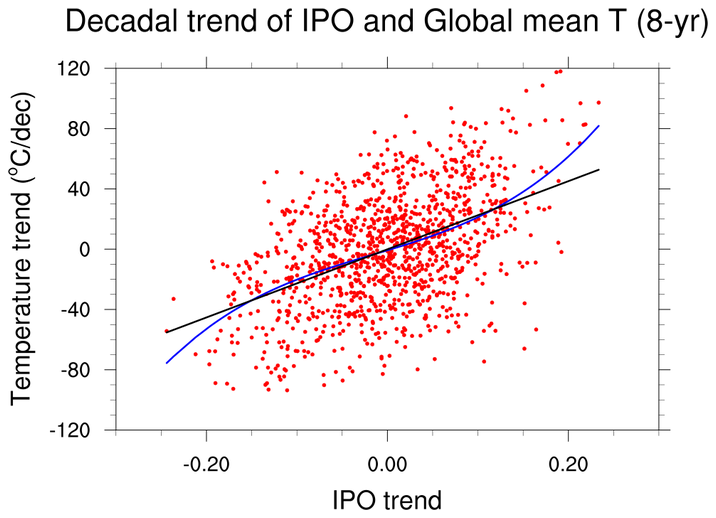 It has been called 'the most popular nonparametric technique for estimating a linear trend'." 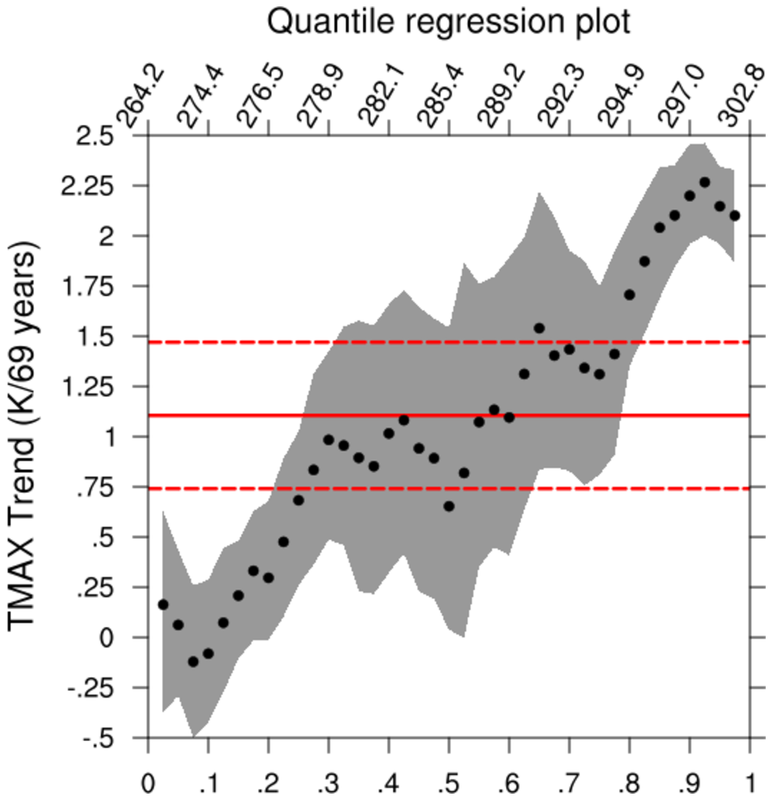 The trend_manken function performs both the Mann-Kendall test and Theil-Sen trend estimation. The USA's Environmental Agency provides a basic description of use and interpretation: Statistical Analysis for Monotonic Trends. regress_1.ncl: Tabular data ( regress_1.txt ) contained within an ascii file are read. 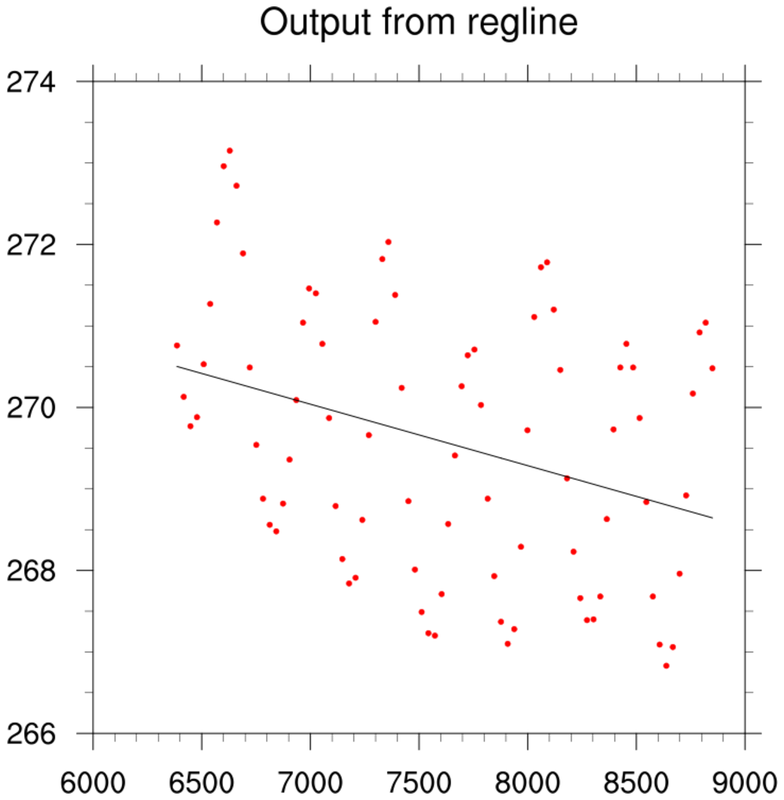 The regline function is used to calculate the least squared regression line for a one dimensional array. Here, the regression coefficient is synonymous with the slope or trend. 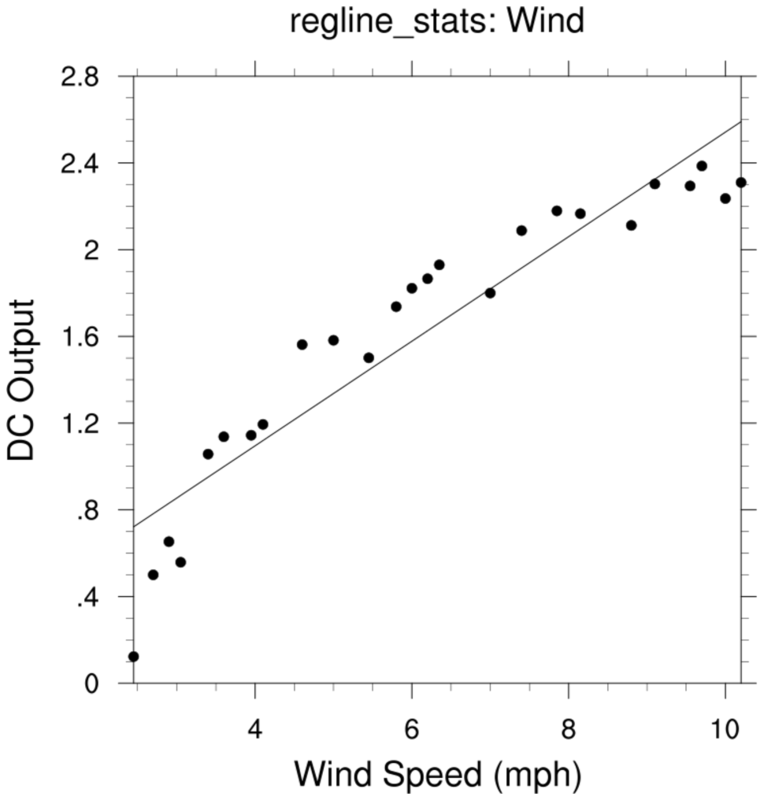 regress_1a.ncl: See regline_stats Example 1. 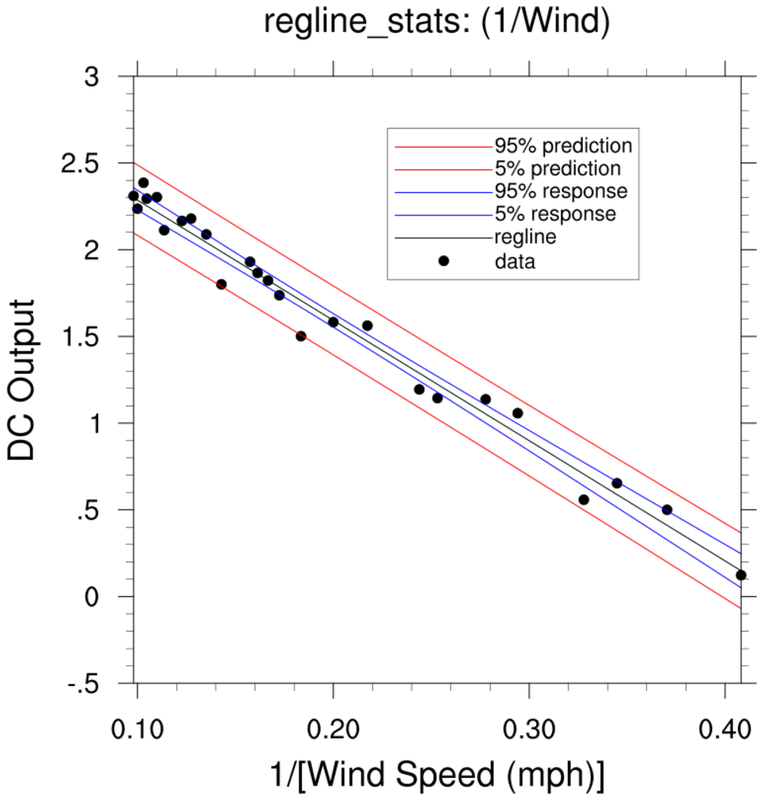 This uses the information provided in the NCL 6.4.0 release to plot 95% mean response (blue), prediction limits (red) and lines derived using the 95% limits if the slope and y-intercept (green). regress_1b.ncl: See regline_stats Example 2. This is a commonly used WWW example taken from: http://www.stat.ucla.edu/~hqxu/stat105/pdf/ch11.pdf. 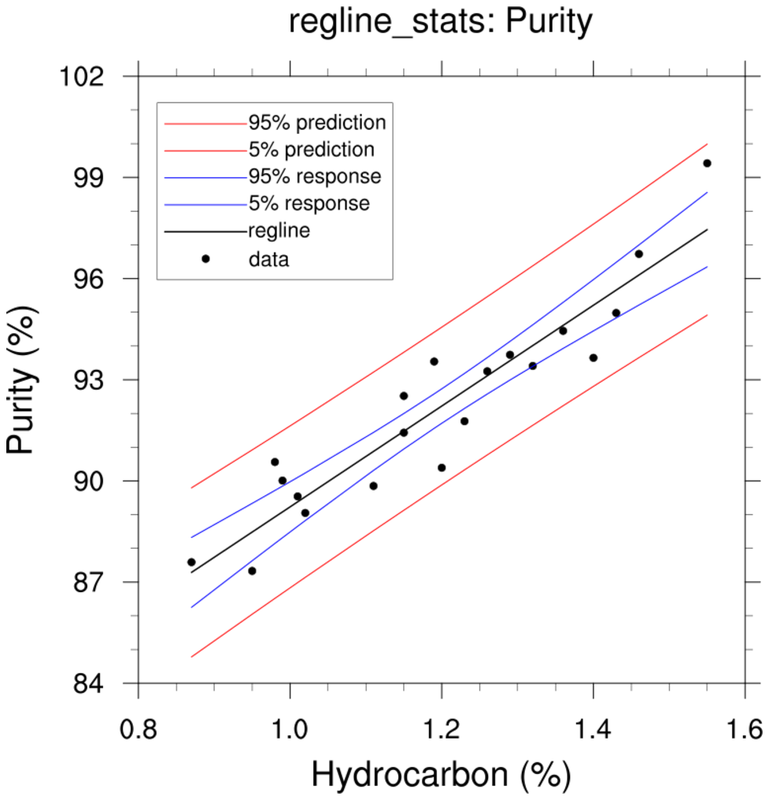 This uses the information provided in the 6.4.0 release to plot 95% mean response and prediction estimates. regress_1c.ncl: The reciprocal approach is mentioned at the end of http://www.stat.ucla.edu/~hqxu/stat105/pdf/ch11.pdf. R code for processing this is at http://people.stat.sc.edu/Tebbs/stat509/Rcode_CH11.htm. The point of this example is that one should examine the residuals from the fitted regression line. An obvious feature is that the values at the extremes are lower than the fitted line while the bulk of the middle values are above the fitted line. The scatter about the fiited line is reasonably distributed suggesting that the reciprocal transformation is a better fit than the original model. regress_2.ncl: Read sea level pressures (time,lat,lon) over the globe and use regCoef to calculate the regression coefficients (aka: slopes, trends). The time units attribute is "days since 1850-01-01 00:00:00". Hence, the trend units are Pa/day. These are changed to Pa/year for nicer plot. 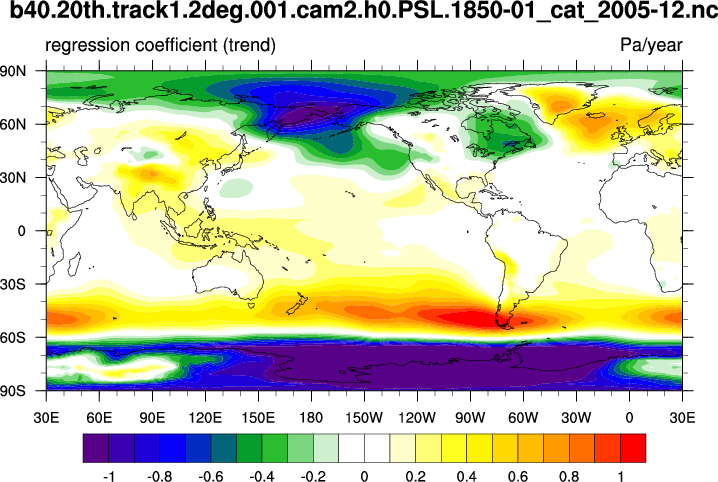 regress_3.ncl: Read northern hemisphere near-surface temperatures spanning 1901-2012 from the 20th Century Reanalysis. 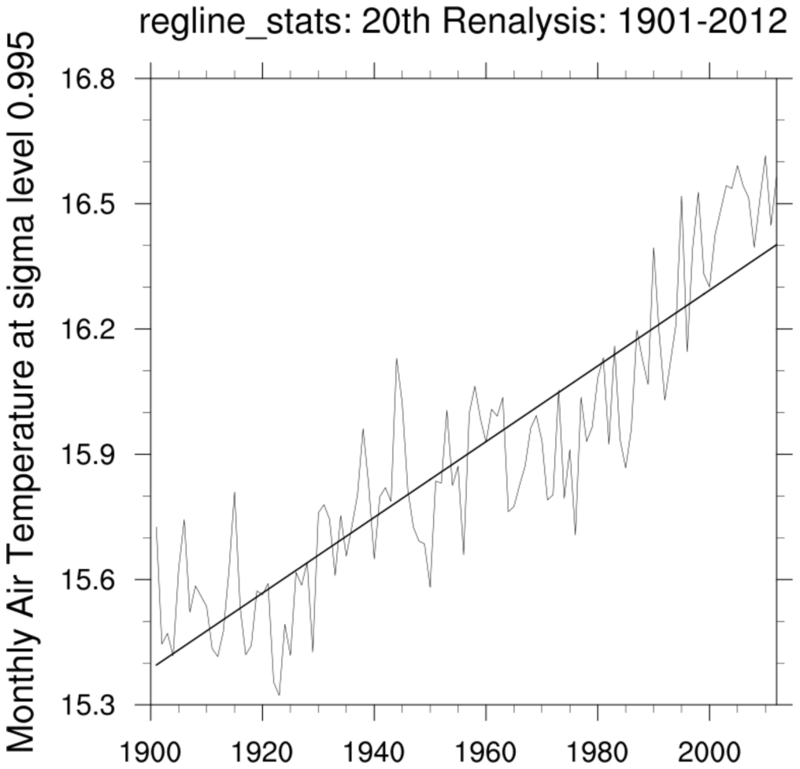 Calculate the areal weighted annual mean temperature for each year. 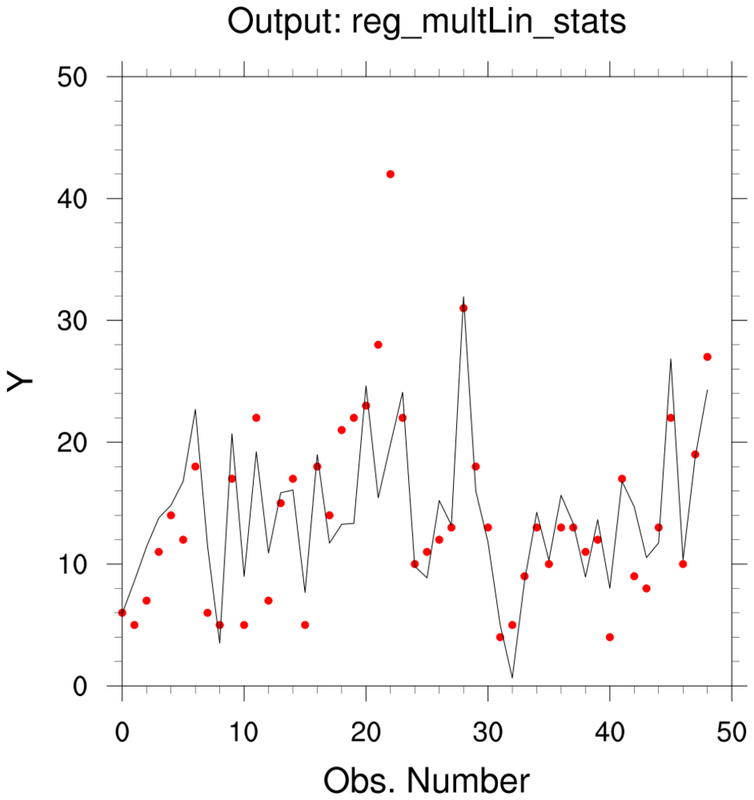 Use reg_multlin_stats to calculate the trend and other statistics. 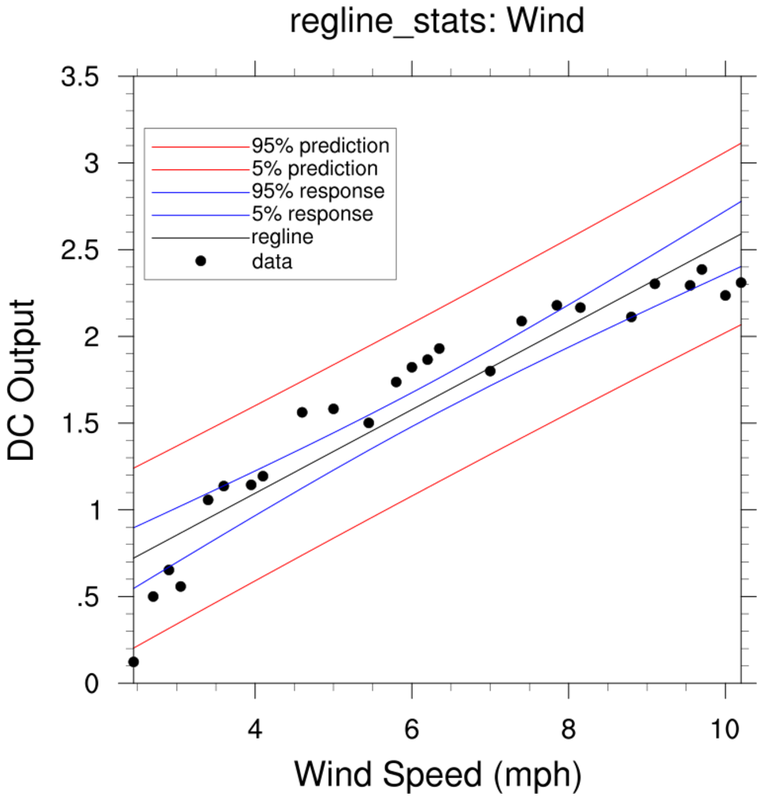 Note: regline could also have been used for the regression coefficient. 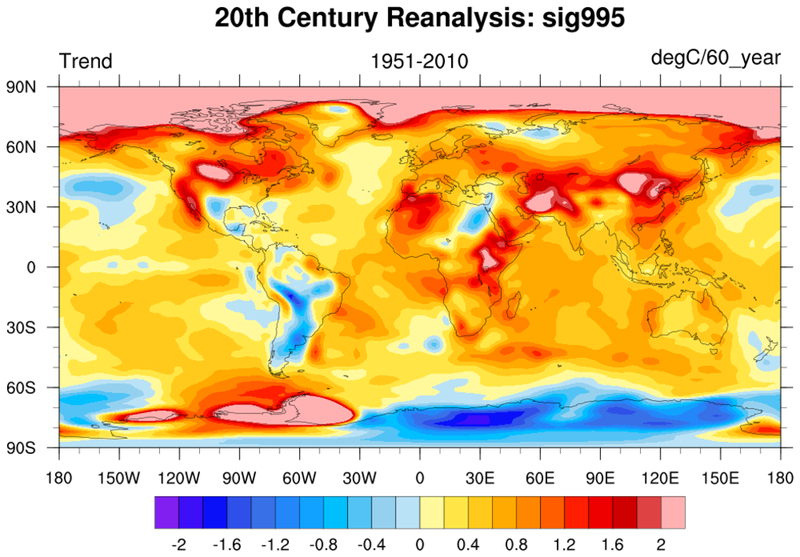 regress_4.ncl: Read northern hemisphere near-surface temperatures spanning 1951-2010 from the 20th Century Reanalysis. 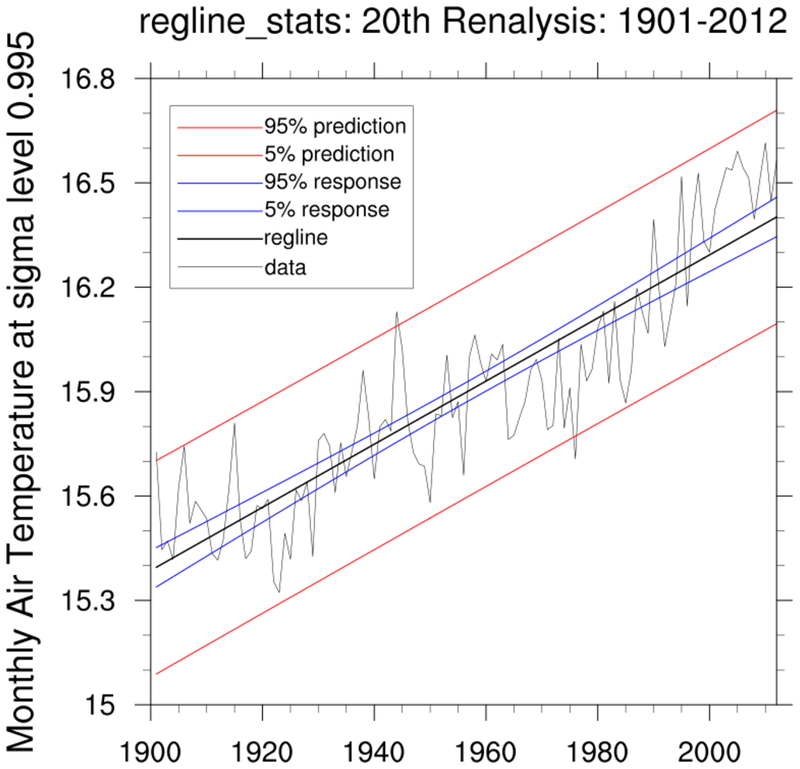 Calculate the areal weighted annual mean temperature for each year. Use regCoef to calculate the trends. regress_6.ncl: This is based upon a script created by Aixhu Hu (NCAR). (d) Plot markers and the polynomial and regression lines. 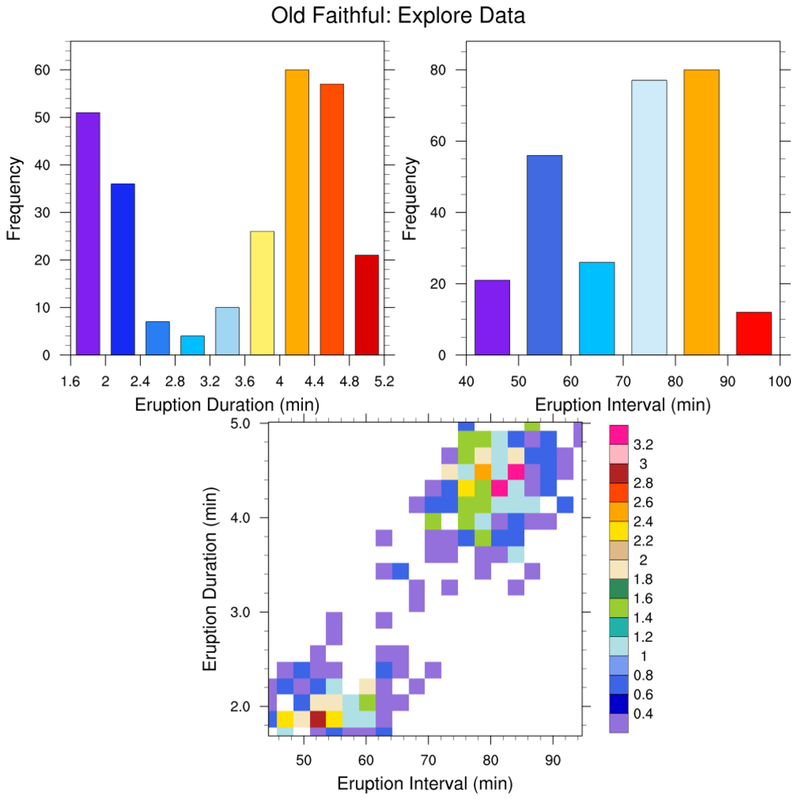 regress_8.ncl: The Old Faithful Geyser Data is used by R and other tools. 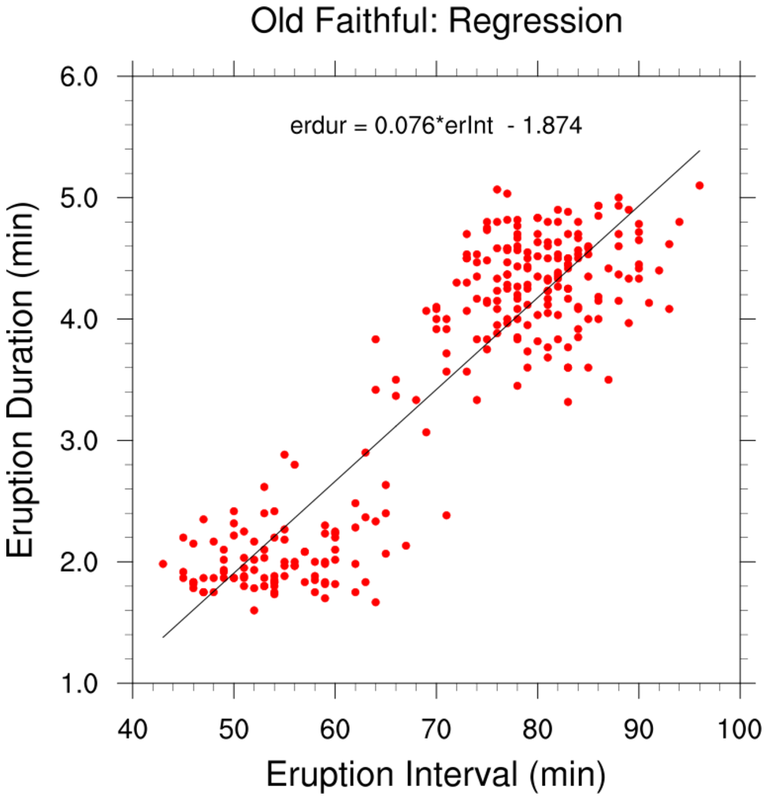 It contains two variables: (a) the waiting time between eruptions, and (b) the durations of the eruptions for the Old Faithful Geyser. 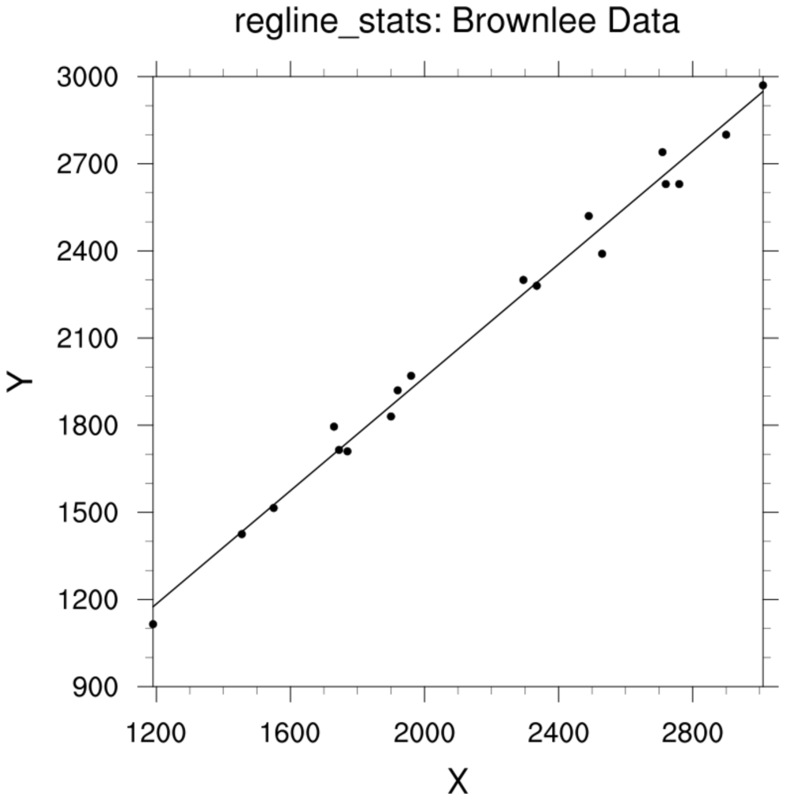 Here, a bivariate linear regression is performed using regline and regline_stats. 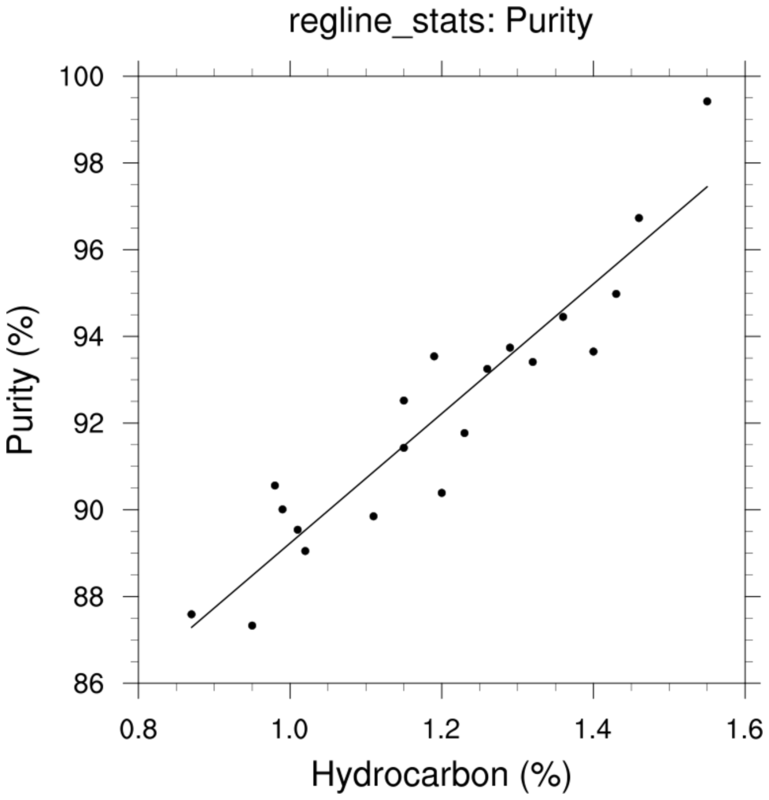 A comparison to the output from R is shown in the examples associated with these functions. (g) use NCL graphics to plot the returned information. manken_1.ncl: Read an ascii file (TA_Globe.1850-2014.txt; source (Met Office Hadley Centre) and extract pertinent columns. Compute the simple linear regression (regline_stats; red) and Mann-Kendall/Theil-Sen (trend_manken; blue) trend estimates over three periods. Here, there is virtually no difference between the derived values. Both 'lines' are plotted but only the values from the Mann-Kendall/Theil-Sen are shown. If there are outliers or skewed data, the Theil-Sen is likely to give the better linear trend estimate. manken_2.ncl: Read an ascii file (rutgers.snow_cover_extent.time_series.txt; source ( Rutgers Univ Global Snow Lab) and extract pertinent columns. 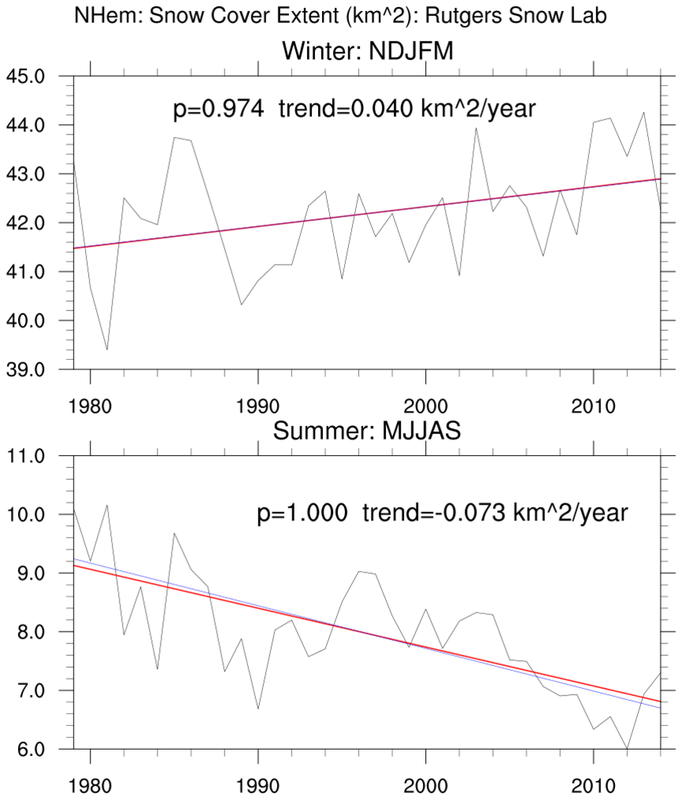 Compute the linear regression and Theil-Sen trend estimates for winter (Nov-Dec-Jan-Feb-Mar) and summer (May-Jun-Jul-Aug-Sep) over the satellite era (1979-2014). Both simple linear regression (regline_stats; red) and Mann-Kendall/Theil-Sen (trend_manken; blue) estimates are shown. The summer trend lines illustrate a small difference between the trend estimates. 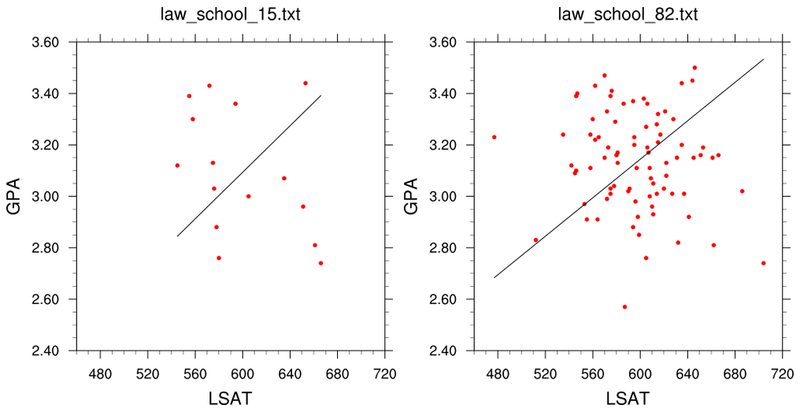 It is likely that the distribution of residuals about the linear regression line is slightly skewed. Hence, the Theil-Sen is likely better.